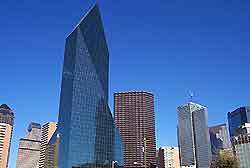 Since Dallas and Fort Worth are both so close to Irving, it is easy for visitors to any of these three cities to take advantage of each city's attractions. 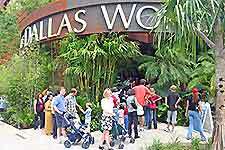 Dallas' Fair Park is a must for visitors, while the zoo at Fort Worth will delight all animal lovers. Covering a hefty 277 acres / 112 hectares, Fair Park in Dallas is a giant complex that mixes amusement with culture in a variety of themed areas. Among the attractions on offer here are the Aquarium, Science Place, Music Hall, Museum of Natural History and Omnimax Theater. The Dallas World Aquarium boasts over 85,000 gallons of salt water that is home to a wide variety of exciting marine life. Visitors have access to a unique underwater tunnel which allows close up observation of a huge selection of sea creatures. Fort Worth Zoo is only 40 minutes' drive from central Irving and is home to over 6,000 exotic animals belonging to around 400 different species. Aside from the animals, other attractions at the zoo include the Country Carousel, Tasmanian Tower, Lonestar Mining Company Movie House and the Weather Theater. 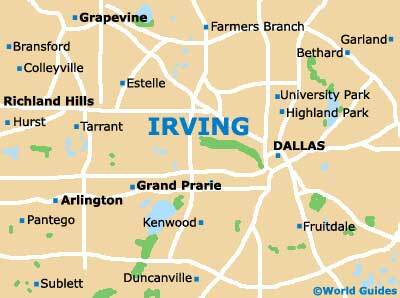 A 20-minute drive from central Irving brings you to the Dallas Zoo, home of one of America's best African animal collections. Visitors can appreciate the sights of ZooNorth and the Wilds of Africa on foot or from a distance via the park's monorail system. 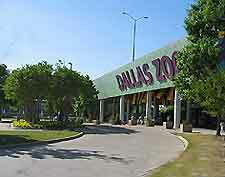 There's also a children's zoo, where the emphasis is on both education and entertainment. At the Dr. Pepper StarCenter Ice Arena the NHL's Dallas Stars battle it out against other US ice hockey teams in front of enthusiastic crowds. Those who are looking for exercise can take advantage of the public skating that is offered at the facility throughout the week. Lessons are available for novices, while the junior hockey team is open to resident children. The Southfork ranch property is known to millions as the central location and focus of activity of the 1980s soap show, Dallas. Tours of the property give visitors a chance to relive some of the show's classic moments via a selection of memorabilia that are on display for fans' viewing. Interesting attractions on display at Southfork include the famous gun that shot JR Ewing and Lucy's wedding dress.